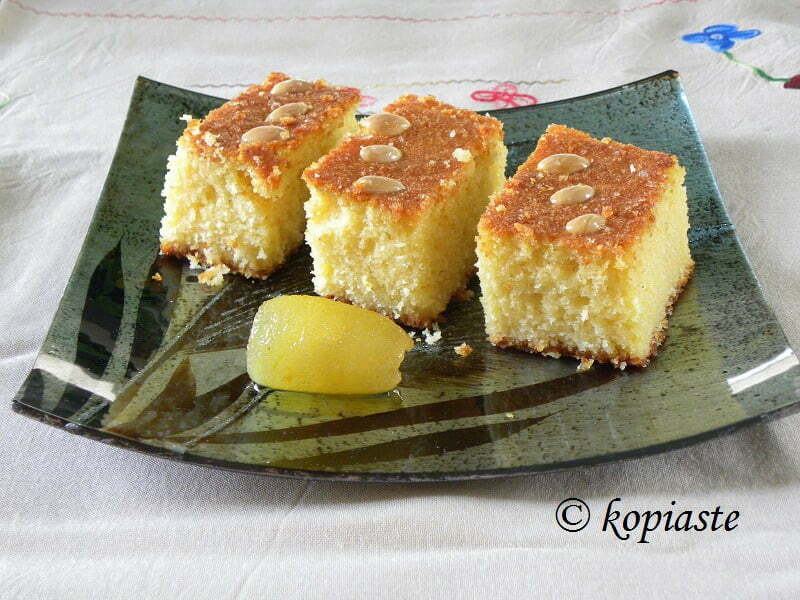 Revani or Ravani is a Greek semolina cake, which I have already published in the past. A few weeks ago when I made Bergamot fruit preserve, I decided to make more syrup than needed as I love using it in other recipes. When I started making the Revani I used bergamot zest as well syrup from the fruit preserve. When I make the fruit preserves, I always store the zest in the deep freezer so that I can use in my recipes. It’s not the first time I’ve made recipes using leftover syrups from fruit preserves, as I was the first one to start making good use of the leftover syrups. In many of my recipes I do not describe the taste as many of them are posted even two years later so it’s hard to remember the details. However, I do know that it is good, otherwise I put the recipes, which I am not satisfied with their outcome, in a different file to be tested again. I made the first revani two weeks ago with butter, adding coconut as well, as I had some leftover from Christmas. I made it again two days ago and after taking the pictures, we ate the cake and I still have its wonderful taste in my mouth. I must say that this is by far the best revani I have ever eaten until now and there is nothing I would like to change. It is moist, light as sponge, fluffy and the bergamot adds such an amazing aroma! You may think that it would be overly sweet with the addition of the syrup on top but no, it’s just as sweet as it should be. Personally, I don’t like my desserts to be very sweet, so this one was just perfect to my taste. The first one with the coconut was rich and delicious with a little bit of crunch from the coconut, which adds an additional exotic taste. As I said, it was so good that I made it again a couple of days ago. This time I wanted to try it with olive oil. I did not have much semolina left from the previous one and as we will soon be going back to Assini, I did not want to buy more and have leftover, so I added flour. I did not have coconut and I only had four eggs. At the time I thought that by adding two eggs less I would need less semolina – flour but since I did not add the coconut it came out just right, without having to adjust the recipe. Finally, I only had one cup of leftover bergamot syrup, so I made more syrup by using 1 cup of sugar, 1 cup of water, a small stick of cinnamon, 3 cloves and boiled it for five minutes. When it was ready I added 2 tablespoons lemon juice as well as the leftover bergamot syrup. As soon as the cake was out the the oven, I added the syrup. You will find the adjustments I made to the second cake next to the first recipe. The olive oil cake was equally delicious as Greek olive oil is light with a fruity taste, which only adds to the flavour. I urge you to try any one of them and you will be hooked. Personally, I love the one I made with olive oil more. I know that it may be difficult to find bergamot in other countries but you can always make it with mandarins or orange. The result will surely be different but equally good as I have made it many times. Prepare the syrup and set aside or use the leftover bergamot preserve syrup. Mix the lemon juice to the yoghurt and set aside for 10 minutes. Beat the butter (or olive oil) with sugar until fluffy, for about ten minutes on high speed. Add the yolks one at a time until incorporated. Combine both semolinas (and flour), coconut (no coconut), bergamot zest, salt and baking powder. Whisk egg whites with lemon juice until the meringue is firm. (It is ready when turning the bowl to the side it should not fall from the bowl). Lower mixer speed and add the semolina with egg whites, alternating a little at a time. Pour in a well buttered and floured 28 cm baking tin and lightly score the pieces. Add three almonds on each piece. Preheat oven to 180o C and bake for about 45 – 50 minutes, depending on your oven or until golden and a knife inserted in the centre comes out clean. As soon as you remove it from the oven, cut the pieces where previously scored and pour the syrup with a spoon on top to wet the cake. Set aside until it cools and absorb the syrup before serving. Serve with a dollop of whipped cream or ice cream on top (optional). This cake looks fantastic and extremely tempting! I love revenue. Thanks for sharing this recipe of Coconut and Olive Oil Bergamot Revani Cake. I will definitely try this at home. Great post! Hello Ivy. Thank you for the great recipe! !